Fast forward to now and the hype never seemed to die down. I started wondering if this appliance was really as fantastic as everyone makes it out to be. 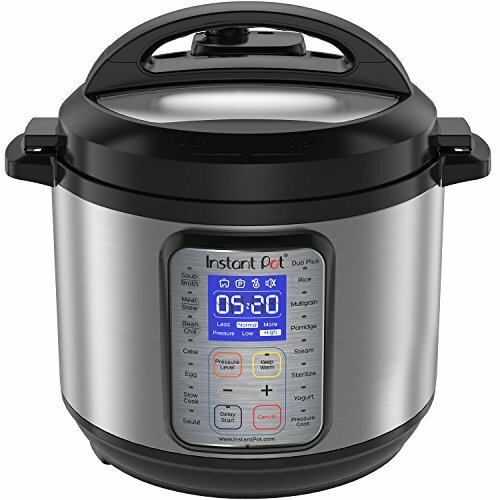 After doing a little research, I discovered that the Instant Pot is a multi-function, programmable pressure cooker. I had never used a pressure cooker, but had always heard that they can be very dangerous. Plus, we already have a slow cooker and a rice cooker, so I didn't think it was necessary to add another appliance to our already crammed kitchen. Still, the rave reviews on Facebook didn't stop. I decided to search for some recipes to get an idea if this thing would actually work for us. I saw so many unbelievable recipes - from 5 minute hard boiled eggs (more on those later), to 1 minute steamed veggies, to being able to throw frozen meat in the pot and cook them quickly. I was sold! My wonderful husband got me the Instant Pot Duo Plus 9 in 1 for Valentine's Day and dinner time hasn't been the same! This device can be a bit overwhelming and I wasn't really sure where to start. I joined 2 different groups on Facebook and started searching for ideas. I decided to do a test run to familiarize myself with the Instant Pot and made a batch of 5 hard boiled eggs. I made another batch (this time a dozen) today, and let me just say that we will now always have hard boiled eggs on hand for snacks, egg salad or quick deviled eggs. Once I got the hang of the pressure valve, it was so easy!! It's like a 10 minute process and you have perfectly boiled eggs. The best part is that the shells come off SO easily. Game changer! Since then I've made the best macaroni and cheese (twice! ), beef stew, shrimp scampi, steamed asparagus and spaghetti (in 4 minutes!). Not too bad for having this thing for about a week. The Instant Pot is absolutely incredible and has saved us so much time and money. We don't have to do as much meal planning, because you can throw frozen chicken breasts in there and have a delicious meal in less than an hour. The possibilities are really endless and I am excited to create more amazing meals! Amazingly, this thing does A LOT - you can sterilize baby bottles, make yogurt and even bake cakes! I am totally getting a springform pan that will fit in the pot so that I can make some decadent cheesecake. So far, I have only used the steam, saute, pressure cook and keep warm functions. I just can't say enough about this appliance and how fantastic it is. I hope to share some of our favorite recipes here.